We looked at the top 1 Wheelchairs and dug through the reviews from 5 of the most popular review sites including BestReviews, Gadgets, Aging in Place, Mobility Pedia and more. Through this analysis, we've determined the best Wheelchair you should buy. 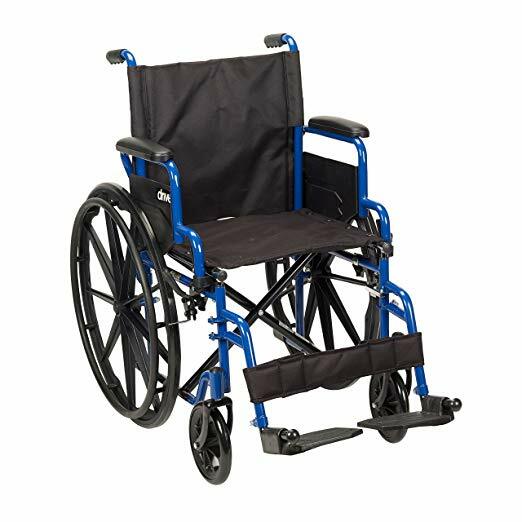 In our analysis of 42 expert reviews, the Drive Medical Drive Medical Blue Streak Wheelchair placed 6th when we looked at the top 7 products in the category. For the full ranking, see below. Bright blue frame. Dependable, solid tires. The tires of the chair have a safety function where you need to push to lock the chair and are made of durable rubber. This is a great wheel chair for the price. Its durable, comfortable, includes many great features such as flip back armrest to slide under desk at the office or booth tables at a restaurant. The construction quality is fantastic with steel and blue-powdered coated frame. "Desk-length" is the only arm choice. Occasional complaints about product quality and durability. Take note that this wheelchair from Drive Medical doesn't have any brakes at the handle as the function for locking the chair is already easy. One major drawback of this chair is that its so heavy; its easily 35-40lbs making it hard to transport by yourself.